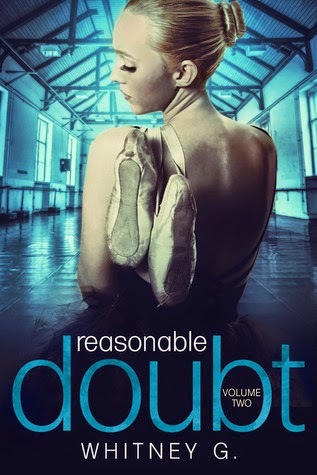 Three Chicks and Their Books: Review: Reasonable Doubt 2 by Whitney G.
Review: Reasonable Doubt 2 by Whitney G.
Let me just say- the first book in this series was a doozy, not only was it hot and had a fantastic plot, it showed that there was depth to the characters- and that's hard to do in a short story. And the cliffhanger- I wanted to die, but I knew I was getting the second part soon, and I was ok with that. How is it as fans we get so impatient for books? I don't think I ever pouted like a petulant child like I did waiting on this book! Now the question that it all boils down to- was it worth the wait? The chapter titles, always get me too- the legal terms, and they go so well with the story. Aubrey is as fiesty as ever- and her parents are the absolute worst. I totally understand her need for intimacy; she desperately craves it because her parents never gave her love or affection. She picked the wrong man to try to start a relationship with though. I feel badly for her- because I know Andrew is feeling something for her, but he won't let himself. And we find out some things about Andrew's "wife" and what went down six years ago that has forever changed who and what Andrew is, but not enough information. I need more- I crave the last installment. So many questions left unanswered. I am hoping these unlocked mysteries will be revealed in the third and final book. Who is EH? What happened between Andrew and his ex? Will Aubrey and Andrew have their HEA? The list goes on and on! This book is a must read for sure!